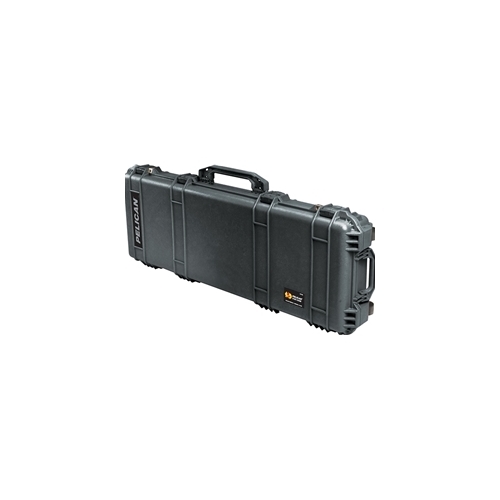 Pelican 1720 Case with Foam (Black) On Sale! The Pelican 1720 Case is the middle case size between the 1700 and 1750. Fold down handles, easy open Double-Throw latches, and Automatic Purge Valve are standard features. And, the Pelican 1720 case is stack-able for convenient storage. Available in Black, OD Green and Desert Tan. And you’ll know it’s a Pelican Case by the distinctive dual band design. It has transport wheels for better handling. Your equipment can fit into the high density foam of the case for total subjection and protection against impact, vibration or shock. A nameplate (included) can be personalized (engraved at additional cost). The Pelican 1720 Case is the popular size long case because it sits right between the 1700 and 1750 case. The 1720 case is perfect for rifles, long guns, telescopes, guitars, and anything with a long profile of 42 inches. For over 30 years Pelican has built a reputation for manufacturing the toughest cases in the world. As a matter of fact, we invented the category. Over these years we've seen our cases used for some fairly crazy activities...and important ones too. Pelican Cases have been thrown out of helicopters in Iraq, floated through frigid fjords in Norway and rolled over by SUVs in Tanzania. With only a few scratches to show on the outside, contents inside are left unscathed. These are minor details for major bragging rights. And that is really what it's all about. Getting your gear from point A to point B in the condition it's meant to be in: intact and functional. Because it might contain a large format camera that will shoot next month's magazine cover or a heart defibrillator that could save a person's life, you can't put a price on it. © Boss Safety Products 2018. All Rights Reserved. Site design and development by AspDotNetStorefront.